One of the three cougars spotted in rare photos from B.C. 's Sunshine Coast earlier this month has been destroyed by a conservation officer because the animal strayed too close to an elementary school. The cougar was spotted walking past a house in Roberts Creek on Monday afternoon. Conservation officer Dean Miller tracked the 60-pound animal and found it just a block away from the Sun Haven Waldorf School, he told The Huffington Post B.C. Tuesday. "I don't take wildlife destruction lightly. 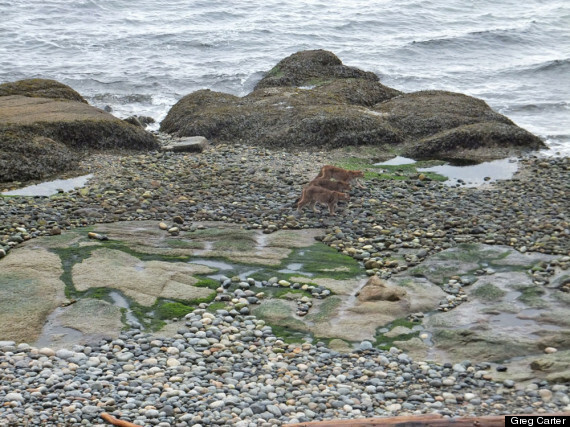 However, we have to weigh the potential risk to public safety and balance that out with conservation initiatives," said Miller, who is based in Sechelt. "We get lots of people reporting cougar sightings and typically it's just a cougar passing by a trail or crossing a road quickly — it's a very solitary and shy animal. We won't respond in that when it's conducting a very natural life process. But in this case, the behaviour put up some flags, and the proximity to the school and it being in a fairly urban area — we just couldn't bear that risk anymore." 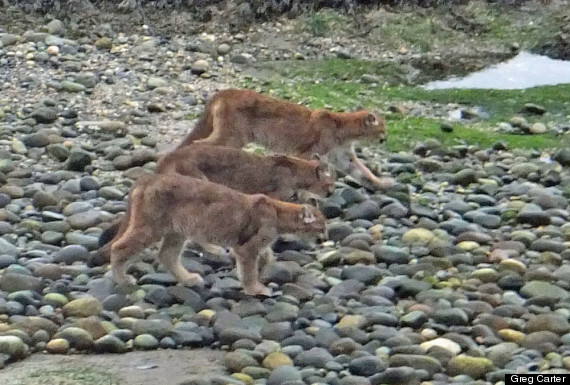 On Jan. 2, three cougars were photographed by Roberts Creek resident Greg Carter. It's very rare for cougars to be spotted in the wild travelling together and the photos quickly went viral. The female cougar shot on Monday was "not quite an adult but pretty close," said Miller. He believes the other two animals were the cougar's mother and a sibling. Ian Hunt, whose daughter goes to Sun Haven, said for the past two weeks, students have not been able to go about their regular school activities, like walking on the beach, because of cougar warnings. "I have mixed feelings. It makes me quite sad, as they are beautiful and elusive creatures," Hunt told HuffPost B.C. in an email. According to Miller, the fact that the cats appeared skinny in the photos is normal: "Most predatory animals don't eat as often as we think. I think there are low periods of consumption during the year and this is probably one of them." "The tragedy is that this is their habitat as well, and humans are increasingly encroaching on it," wrote Hunt, who owns the Roberts Creek Health Food Store. "That being said, the Sunshine Coast has a vast amount of wilderness, and the narrow but densely populated strip of coast is really a fraction of the available territory. I find it odd that these cougars felt comfortable to spend so much time in relatively close proximity to humans." Miller pointed out it's almost impossible to relocate cougars, who can travel up to 40 kilometres in one day. "Again, it comes to public safety. Where do you relocate them to? B.C. is more populated than people think," he said. "There's been so much change, development of our natural resources, camps all around, ecotourism areas." Younger animals, including bears or cougars, could be preyed on by other animals if they're relocated to an unfamiliar area, Miller pointed out. "It could be a death sentence," Miller said.